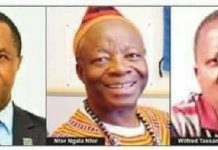 About five leading members of Cameroon’s opposition party, SDF have met in Bamenda to decry every torture and maiming of Anglophones and a return to normalcy in Cameroon. The group of five include the party chairman Ni John Fru Ndi, Dr. Simon Munzu, Barrister Agbor Balla, Prince Ekosso and Mrs. Ndi Christine. 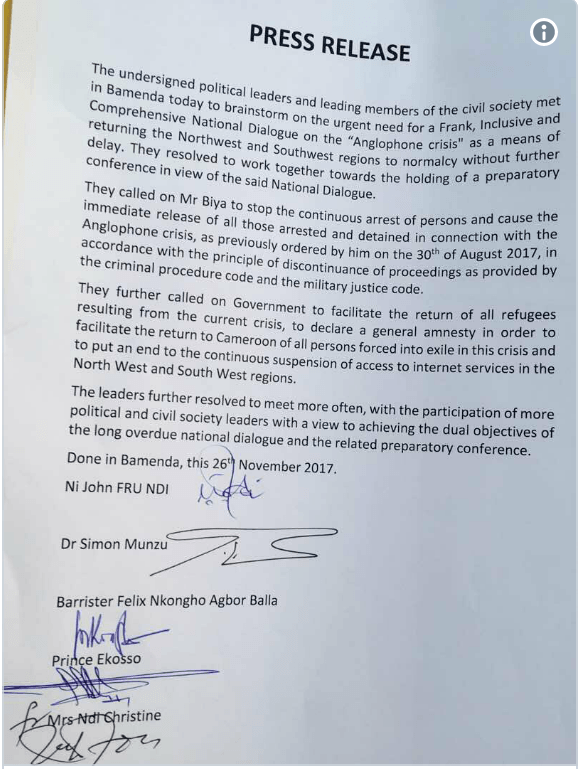 They issued out a press release asking the government to release all persons held in connection with the crisis, ensure freedom and amnesty to all refugees resulting from the current crises and put an end to internet restriction in the Anglophone regions which was a reinvigorated strategy in late September to curb down activist’s actions. 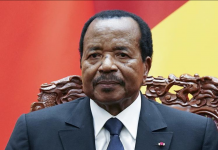 The group enumerated a number of things to be done for Cameroon to be peaceful, stressing on the need for urgent, frank and comprehensive national dialogue on the Anglophone crisis. 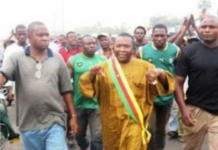 The politicians are certain that only dialogue can bring peace to the Northwest and Southwest regions of Cameroon which should have been avoided long ago if the government had obeyed several calls. 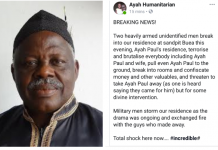 It should be noted that more than a year into the Anglophone struggle, several deaths have been recorded, hundreds injured and thousands have fled to neighboring Nigeria as refugees. 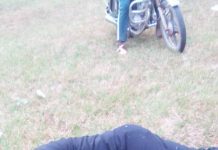 Some incarcerated at the Kondengui prison have been released but intimidation continues and Anglophones leave in constant fear and unrest. The recent wrangling of Bamenda, Kumbo and Mamfe still paints a worried picture in many hearts. 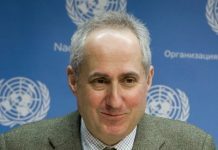 Hopes were that the “Facebook Republic” as it was called would end its operation on social media, but things seem to be going further than just social media posts. We all look up to the government to take the bold step and call her people to the dialogue table. Stay with ARREYB News Reports for exciting and thrilling content. Join thousands who read us daily!!! 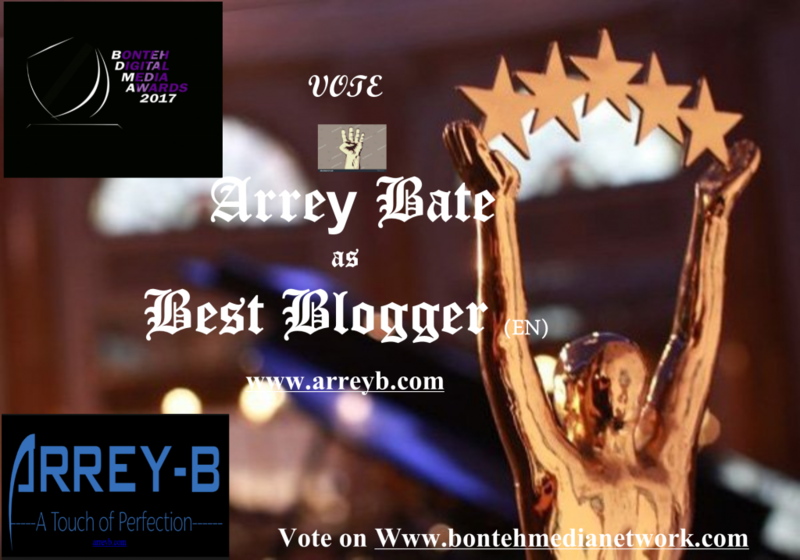 Plzzzz vote for Arrey Bate as Cameroon’s Best Blogger (EN) into the BDMA 2017 Awards.